On Sunday, August 23rd, the second annual Coconut Festival took place in downtown Toronto. As a rule, there seems to be this mad dash to blog just how amazing an event was! I will get to that! will find coconut sap, flour, vinegar and oil on their menu plans. Before I jump on the Coconut Festival Love bandwagon, I feel the need to point out, “I am bias!”. I didn’t stumble upon the festival while walking my Chihuahua. No, I wasn’t dragged there by a healthy friend. My motivation was completely different. I was there early morning amidst the hustle and bustle. I had an hour to set up a booth. Let me explain. This past spring, I sought out Anne Josef, owner of Cocovie Naturals in search of required co-op hours. I wanted to combine my love of this flawless fruit with understanding how to launch a product. I live, love, blog and even appeared with Anne on thatchannel.com leading up to the festival. 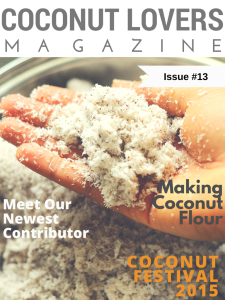 The Coconut Festival allowed me one last opportunity to answer questions about the internal and external benefits of living a coconut loving life! “YES, my hair is long and lush. My leave in conditioner is coconut oil! 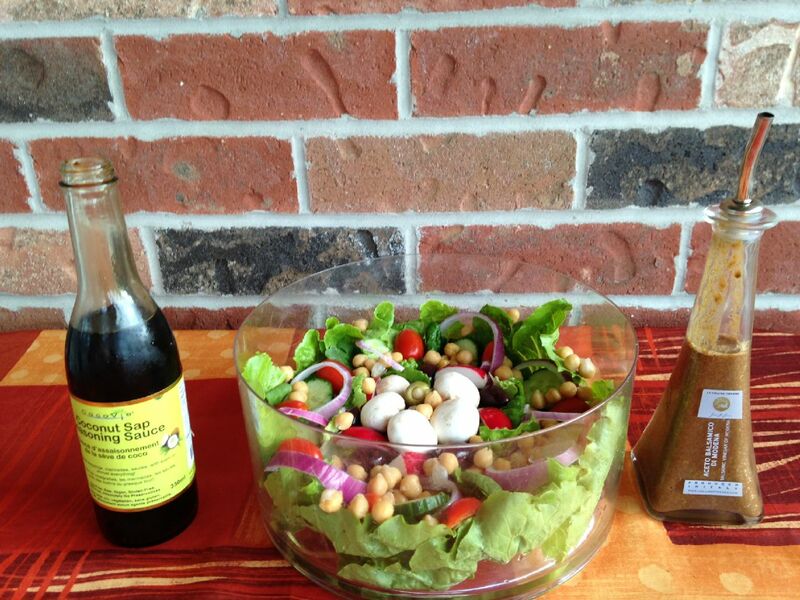 Yes, our vinegar is nature’s probiotic. Yes, sap is the perfect gluten and soy free ‘soy sauce’ replacement! Yes, I do oil pulling in the shower!”. I could go on forever. Being at a show is busy, actually crazy but when your vendor sponsors the event, it’s FABULOUS! I’m not going to list all the sponsors. However, I will point out that Organic Garage is a stunning grocery store for keeping life holistic! I can’t forget Tonic Magazine because I’m beyond excited to appear in the September issue. Yes, a shameless plug for myself! As you read, bare in mind I was working the festival. I didn’t get to sample myself into a coconut coma. On the flip side, I had a front tent view to a long list of first rate performers and speakers. As a personal trainer, my interest was piqued when I learned I could become certified In Kelani Dance. Ioana Aboumitri Ieads a “Polynesian inspired cardio hip shaking class” that had everyone trying to keep up! The day was a blur of sampling, selling and smiling for pictures. Ironically, I was beyond thirsty and hungry yet surrounded by decadent vegan chocolate and coconut gelato! I have to give a huge thanks to the sweet girls at nearby UNOCO who delivered refreshing pink coconut water to me. It was love at first sip! I had to do a little investigating. It’s the freshest, cleanest coconut water. I am in love with this funky holistic green bottle with just a hint of pink. UNOCO’S expiration date guarantees freshness. UNOCO brings this Canadian chica closer to the tropics post workout! Holistic healthy reminder: Coconut water is nature’s ultimate replacement for commercial sports drinks. It helps replenish key electrolytes lost sweating! As the clock ticked towards 7pm, vendors were selling out and the stage heated up with Ilana Tarutina. This gorgeous creature captured the audience with her voice as she mixed and played mpc pads with the help of her drummer. August 31st marks the release date for her free download on SoundCloud. The second annual Coconut Festival was done. Today was a success on so many levels. It was officially time to eat. Little did I know how true the saying, “saved the best for last” would be! PAI, Northern Thai Kitchen was new to me. The owners are a husband and wife duo who apparently are doing something right. PAI had a crazy lineup all day. I needed to know why. I took my place in line. They were serving a perfect vegan green curry rice bowl. This dish had my name on it. HEAVEN in a bowl! It is simply the best dish I have come upon in ages! 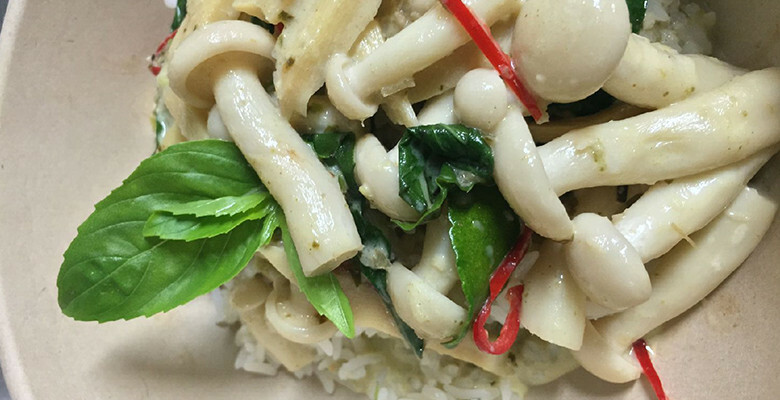 The chef chose a combination of coconut, shimeji mushrooms, rice, thai basil, red /green chili and other secret ingredients. I am literally on the subway as I type. You will find me at 18 Duncan Street in downtown Toronto. It would have been lovely to sip and stroll leisurely through David Percaut Square BUT sharing coconut love is so much more rewarding. That’s a wrap from this Cocovie Natural Ambassador. Next year’s festival event is already in the works! See you soon! Life, Love and coconut kisses!